The Rise of Systematic Biology is part of the Tentative list of Sweden in order to qualify for inclusion in the World Heritage List. More or less this was the dialogue I had at the entry of Hammarby, a component of the Linnaeus tentative site. Turns out credit cards are so pervasive in Sweden nowadays (and cash so rare) that having a broken credit card reader means free entry for all. To illustrate the point a bit further: I am fairly certain that two years later with plenty of business trips to Sweden in between I still carry the same cash I carried that day; I just never got to spend it. Linnaeus is the Swedish version of Charles Darwin, without a doubt one of the most influential biologists in history. His main contribution was to taxonomy. For most of his life he worked as a professor at the university of Uppsala, Sweden’s oldest university. In and around Uppsala there are plenty of sites related to his work. He used nature trails to educate his students in his system and to classify the local plants. And he created several gardens to show the diversity of plants. I managed to visit the central site in Uppsala as well as his country home at Hammarby. The latter was the more impressive site. I did not manage to follow one of his trails, though. As Ian has pointed out this nomination feels eerily similar to the Darwin nomination on the UK tentative list. Both relate to the scientific work of major biologists. But I see a difference between the two sites. Linnaeus' research and teaching were tied to the land. He used the nature he had around the university to instruct his students and show and extend his classifications. And he used his gardens and their system for his research. As such, I find this nomination more worthwhile and tangible than Darwin's home and would favor inscription. Uppsala is connected by train to Stockholm. The train also stops in Arlanda, the main Swedish airport in the middle. I came by train from the North where I had visited one of the decorated farm houses of Hälsingland. In the evening I caught a plane from Arlanda back home. 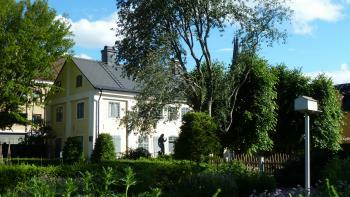 In the town center within walking distance from the train station you will find the garden and home of Linnaeus. I would strongly recommend a trip to Hammarby where more of his gardening system and research is on show. To get there I took a bus from central town. It drops you off at the main road from where I walked up to the estate (15min). Uppsala is Sweden's oldest university town and a very pleasant place to visit. I visited Sweden's only tentative WHS in June 2018 shortly after landing in Arlanda airport. 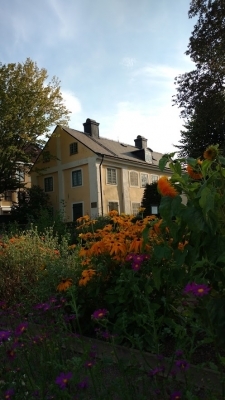 It is just a short drive away to Uppsala where a visit to Carl Linnaeus's home (museum) and garden will give you an interesting overview of who Linnaeus was. Linnaeus was known as the father of modern taxonomy and he was one of the most reknowned scientists in the 18th century. Although it was an interesting stop and it is definitely a site of regional importance especially for Uppsala, I failed to appreciate any OUV overall. Being a couple of kilometres away from Uppsala, towards the direction of my next destination, I decided to stop by another component of this strange WHS, namely Linnaeus' summer home, Hammarby estate (photo). 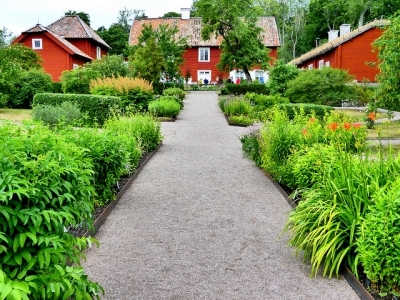 This falun red estate is hailed as one of the most authentically preserved estates from the 1700s with plant species from all over Europe which were mentioned in Linnaeus' major publications, Systema Naturae and Species Plantarum. From May to August, it is open everyday from 11:00 till 17:00 except on Mondays. Its setting reminded me of the Brickendon Estate in Tasmania, Australia. Again, nothing really of OUV was evident even though there are information boards everywhere clearly hoping for inscription on the WH list. Having visited quite a number of WH gardens, I would be surprised to see this tentative WHS inscribed. Perhaps making it a transnational site could help, but until then what made my efforts worthwhile was the delicious fresh strawberry rulltårta fika I had at the Hammarby estate. Reports seem to point to a 2020 nomination from Sweden (likely premature). Perhaps, but this nomination will have to overcome some major challenges to be inscribed. Number one is OUV, and I could not shake the feeling that this serial nomination is of regional importance. While I only visited the most accessible site in Uppsala, other components did little to affirm this nomination can get a positive recommendation from ICOMOS. During my research of all serial components, none stood out as exceptional or significantly more representative of Systematic Biology. Often association with the scientist was on display rather then authentic cultural landscapes that related to scientific innovation. There is an indication that Sweden wishes this nominations to be transnational. The USA, England, Netherlands, and France are mentioned. Yet, for these state parties to become involved, it will almost certainly be much later than 2019 before a dossier is ready. No other state party has made a tentative site addition relating to Systematic Biology. About the site site itself, I can say its an easy train ride from Stockholm, and a 15 minute walk from the station. Summer weather and blooming flowers made it a pleasant visit. The home (museum) is not particularly noteworthy, but for its association with a prominent scientist. 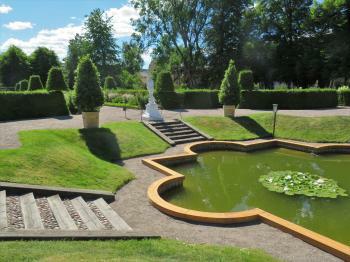 Uppsala is worth visiting, and I would recommend visiting the garden and other sites in this nomination (time permitting). The title is somewhat obtuse but this serial site is focused on sites within Sweden associated with Carl Linnaeus. A sunny Sunday return to Uppsala allowed me to visit perhaps the most important part of this tentative site the Linnaean home and garden. It was a rather pleasant diversion to walk through the garden, looking at the well labelled plants, enjoying the water features and just luxuriating in the bright evening sun. The site reminded me a little of the already inscribed Botanic Garden in Padua with elements of Darwin's home at Downe which seems to have been discouraged from seeking world heritage status. I guess the comparison to Darwin is bound to come out, as both have had a major impact on science, though apparently Linnaeus is the most influential person in history, if you take references on Wikipedia as an accurate guide. There are other sites around Uppsala that make up this proposal, as well as one in the south of Sweden, you can see a map of them here. To be honest the Linnaean garden was pleasant and certainly had merit, though I imagine whether it gets inscribed on the list will have to do with the fine tuning of the application process rather than it having more merit than other proposals. However it certainly is worth visiting especially as it is located in the charming university town of Uppsala, one of Sweden's nicest cities.